Excuses are probably the biggest roadblock people have when it comes time to lose some weight. Excuses are easy to make–real change is hard work. I’m no stranger to excuses. I used all of them when I was 250+ pounds. “It’s genetic.” Some things CAN be changed. “I’ll always be fat.” If I keep doing the same thing I’ve always done. “I’m too tired.” I’m tired because I don’t eat healthy and I sit on my couch binge eating. See what I mean? Excuses abound! Once I finally decided that I couldn’t make any more excuses, I stopped. Reality set in, determination got focused, and I was ready to work through the excuses. I know I’m not alone in the excuses department. What are some that you make for yourself? I’m going to do a short series of posts addressing some of the excuses. The emails I get from people most frequently are questions about how to start losing weight. I wrote a post, I Don’t Know Where to Start, addressing that. The other question I get is HOW did I get into a swim suit at 250 pounds and go to the local pool? The reason I get this question so much is because people are embarrassed, shy, timid, reluctant…plug in whatever word fits…to go out in public when they feel vulnerable. You bet I was anxious about getting in a swimsuit! I was even more anxious because I had so far to walk from the locker room to the pool and I felt like everyone was watching and judging. In reality, they really weren’t. Most people are self-absorbed and not paying attention to anyone else. It was all in my head! And once I got over that and toughed it out those first few times at the pool, it got a lot easier. No one wants to feel like they are being laughed at. I talk to a lot of women that don’t want to work out at a gym because they are self-conscious because men are there. My suggestion is to check out those women’s only gyms. There might not be that many to choose from, but it’s worth a shot. Suggestion: Work out at home first. If the idea of going to a gym and working out with people around makes you cringe, try working out at home for awhile. Watch some videos on Netflix, some yoga or P90X DVDs, try the Nike Training Club App. Get used to the idea of working out so that when you’re feeling more confident you can make the move to a gym. Suggestion: Get with a trainer. If it’s a matter of just not knowing WHAT to do and you’re afraid you’ll look dumb if you do it wrong, sign up with a personal training. There are TONS of options. You can get private sessions (sometimes they will even come to your house, or you can meet at a high school track), you can do group training sessions, or sign up at a gym. A good trainer will be patient with you and help you learn how to do the exercises. Suggestion: Stay in the back of the room in fitness classes. This is totally me. Even now. I’m fit and active and confident in my abilities but I still hate going to classes and I hate being in front even more. I make sure I’m at the class early so I can get a spot in the back. Suggestion: Choose solo activities. Instead of group activities or gym workouts that are out in the open, try an activity that’s kind of reclusive. Swimming is a good option. Once you get in the pool, no one can really see your body and you can escape into your own little world. Yoga is also a good one because the lights are often dimmed in classes. Spin is another good one –get on a bike in the back of the class! Suggestion: Wear clothes you’re comfortable in. Sounds pretty simple but you’d be amazed at how a good-fitted outfit can improve a mood. If I don’t feel comfortable in my workout gear, I tend to be more timid, anxious about my stomach, pulling on the shirt to cover my stomach, etc. Good workout gear can make you feel confident and happy! Lastly, focus on change and positivity. If you focus on the goal you want to achieve, you’ll start to think less and less about how you LOOK doing it. 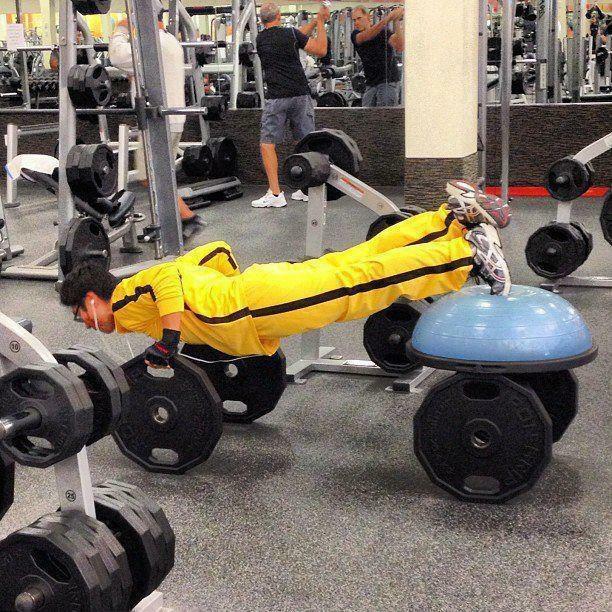 And remember, no one is really paying attention to other people in the gym. QUESTION: How did you get over the “I don’t want to look dumb” feelings?